Shared on DB and Twitter. Great review. I’ve read all the Banktoun trilogy too and the wonderful Christmas book she wrote is one of my favourite seasonal reads ever! So I’m desperate to read this one too! Great review that only makes me want to read it more. I love Orenda, they have published some of my favourite books. This one sounds fantastic and I can’t wait to get my hands on a copy! Congratulations, Maria. 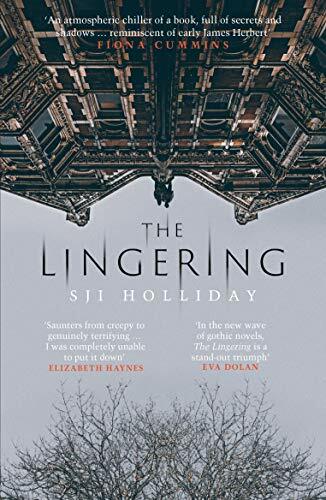 You’ve won a copy of The Lingering by SJI Holliday. Could you please email your address to hookedfrompageone@gmail.com and I’ll arrange for your prize to be sent out to you. I am a newbie to this author, although I have heard of her books before. Love the cover and I am a sucker for an eye catching book, especially with a brilliant recommendation of what is inside. A fab review, made me even more excited to read this story. It’s sounds like a proper creepy tale, perfect for cold dark nights! Great review, sounds like an interesting book. I’d love to win this – it sounds like a great read! I love anything spooky & supernatural so can’t wait to read this!